Mexican Bird of Paradise the perfect summer-blooming tree for small urban lots, low-maintenance medians and even large patio planters. Plants have small round dark green leaflets that provide a soft airy or ferny texture. In warmer climates this tree can maintain its foliage year round. Their prolific yellow blooms form clusters at the end of the stems and reach up to 6-inches in diameter. The bright blooms attract hummingbirds and butterflies. 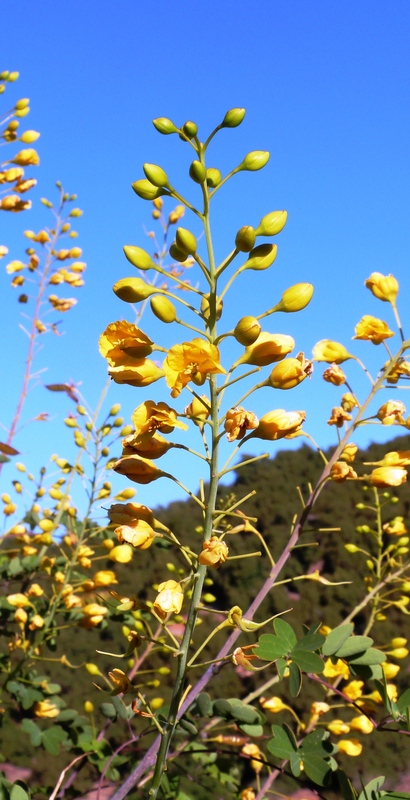 The flowers are followed by tan to yellow seed pods that contain poisonous lima bean shaped seeds. In preferred climates this tree can reseed freely. Plants are particularly showy when planted en masse. This small tropical tree, or large shrub, can reach 15’-20’ tall and wide once mature. However, plants remain smaller in cooler climates and may freeze to the ground in marginal zones. Where plants are perennial, you can control their size with annual pruning. Mexican Bird of Paradise does best in well-draining soil and has low watering requirements once established. This tree thrives in full sun but can tolerate some shade. Be careful not to plant in too much shade or blooming will be minimal. Very tolerant of radiant heat.